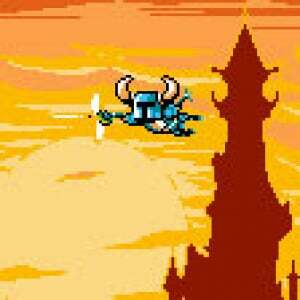 Shovel Knight is the adventure of Shovel Knight, a knight with a shovel. That simple — and gloriously absurd — premise has somehow resulted in some of the strongest hype the 3DS eShop has seen yet. The good news is that the final product absolutely lives up to the lofty expectations; the even better news is that it effortlessly exceeds them as well. When you consider the fact this is the début title from Yacht Club Games — comprised largely of former WayForward employees — and that this is also on Wii U, you get a sense of the love and care invested in this game. 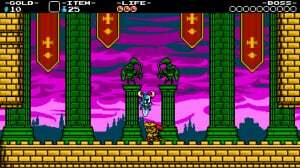 To say too much about Shovel Knight would be to rob the game of many of its surprises, but it's safe to say that fans of 2D platformers are in great hands here, and fans of retro gaming are in even better hands. 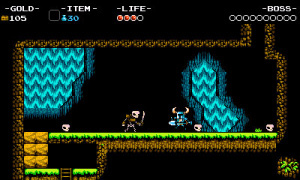 Shovel Knight, as has been clear from the start, is an 8-bit throwback title. 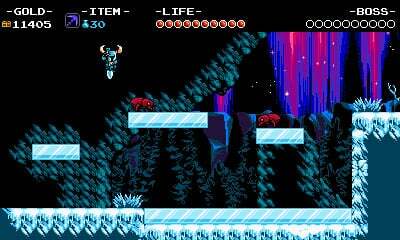 However it's worth pointing out that unlike Retro City Rampage DX or 1,001 Spikes, Shovel Knight doesn't simply borrow an aesthetic and winkingly acknowledge the conventions as it subverts them. While those are each great games, they are great games that deliberately dress down for the occasion. Shovel Knight, on the other hand, isn't content to remind us of what classic platformers looked like, or the kind of brutal difficulty for which they're still known. 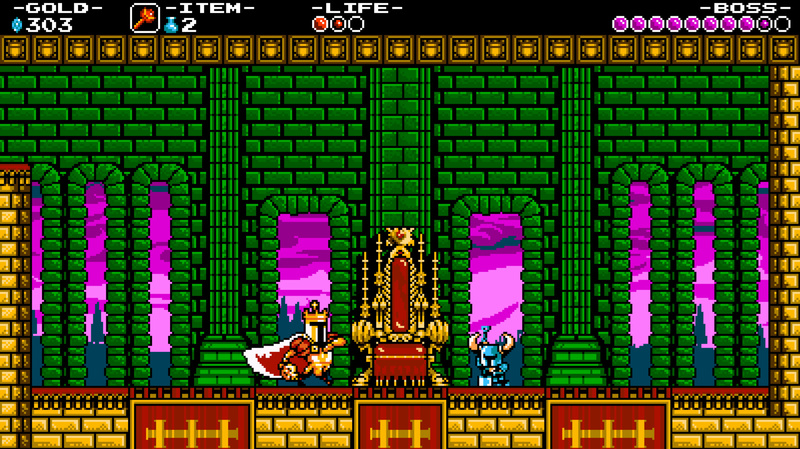 Shovel Knight's similarities dig deeply enough into its inspirations that it actually manages to figure out why they worked the way they did, why they're so fondly remembered, and what, specifically, it took to make a game like that work. In short, Shovel Knight doesn't want to remind us of the past — it wants to take us there. The game itself draws from many obvious inspirations, but it never, even once, relies on our fondness for those original games to carry us through. In every case, it unearths some recognisable aspect of another title, and then actually makes it better. The clearest example of this is probably Zelda II: The Adventure of Link. Whereas that game has its fans (and rightly so) it's difficult to argue that there wasn't room for improvement. 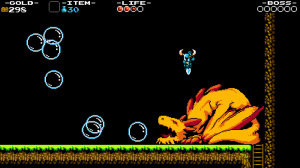 Shovel Knight adopts so much of what made Zelda II great, but strips away what held it back. For instance, the swordplay. 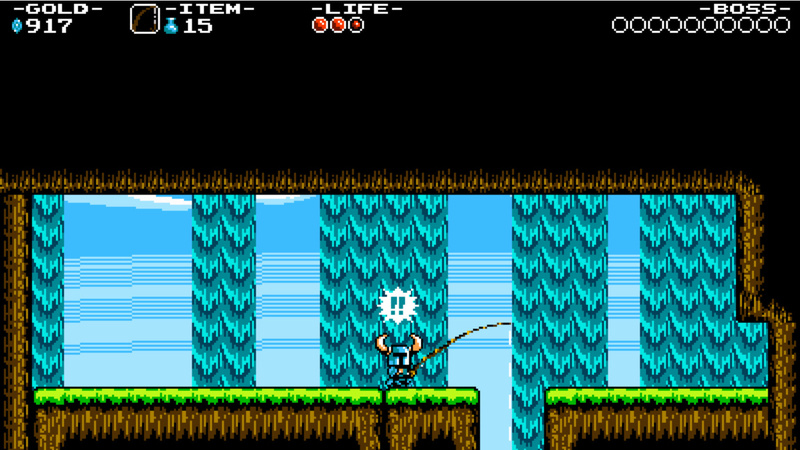 Shovel Knight's weapon works a lot like Link's, but the actual combat is more refined. To make clear the parallel, Shovel Knight even recreates specific enemy types — the slimes, the flying horse heads, the shielded warriors — and gives us a chance to engage with them more fairly, more interestingly, and more cleanly. The corridors aren't as tight, the enemies don't take obscene amounts of hits, and adversaries can actually be out-thought rather than exploited. 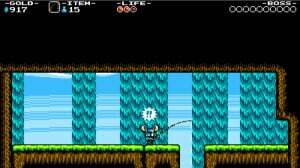 In fact, much of Shovel Knight plays like the game Zelda II should have been, right down to the purchasable health and magic upgrades that negate the need for tedious grinding. But that's just the start. The Castlevania series finds its treacherous clocktowers and vertical climbs reborn here with more natural physics and less of a reliance on pixel-perfect jumps. The challenge in these sequences isn't stripped away, or even reduced; it's simply refocused. It's a game of skill now, rather than luck and memorisation. The Mega Man series is another obvious touchpoint, with Shovel Knight's themed bosses, environments, and weapons. (The fact that one of the original Mega Man composers is on board for the soundtrack doesn't hurt anything, either.) 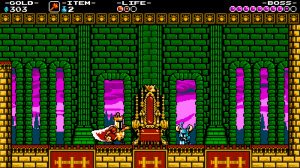 However, instead of expecting one or two truly good boss fights, as most Mega Man games were able to offer, every one of Shovel Knight's bosses is a unique experience, requiring entirely new kinds of skill-sets to master. Additionally, each boss's weapon is hidden within the stage; you aren't simply handed it upon lucking your way through a battle. None of them are necessary for progression, but this game expects you to work for your rewards. 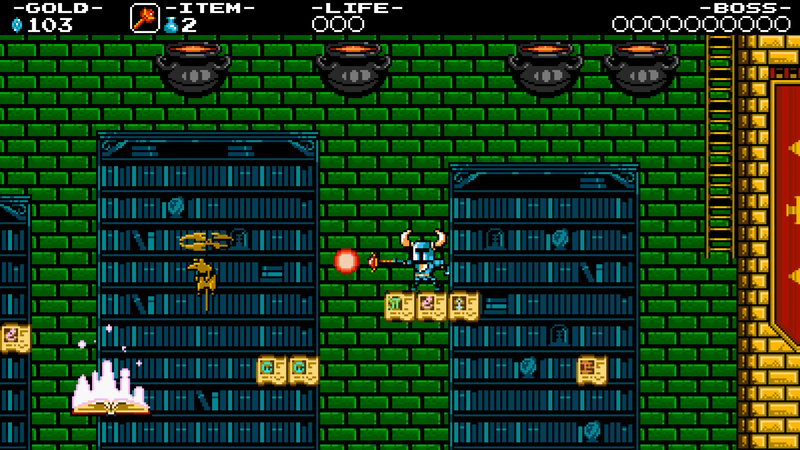 Much of Shovel Knight's appeal comes from its absolutely perfect control scheme. True to its 8-bit ancestors, you'll only need two buttons. You can map them however you like, which is nice, but ultimately you'll never have to do much more than jump and swing your shovel. Upgrades to your weapon and armour add minor wrinkles to the otherwise simple moveset, and the ability to thrust downward by pressing down while in the air is a thrilling, infective lifesaver, but overall, those are your tools. You can jump and you can melee. Your enemies can do a lot more than that. By limiting the moveset, the game forces you to master it. Not get comfortable with it or understand it, mind you, but actually master it. Your job is to strategise within tight boundaries, a task that seems all but impossible at first, but soon settles into a rhythm of ongoing, surprising evolution. The "special weapons" in this game are referred to as relics. As you might expect, some are more fun to use than others, but they all have their purposes. From arcing anchors to fishing rods to deadly coins that shake more treasure out of fallen enemies, there are a lot of optional moves to master, but the limited amount of magic means that you'll never be far from relying on that trusty shovel of yours again. 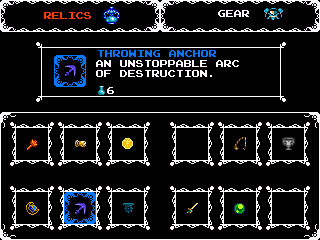 The relics can be selected from the 3DS touch screen, which is great for spur-of-the-moment switches, but in certain puzzle rooms you may want to pause and choose your relic that way, so that platforms and enemies don't keep moving while you find what you're looking for. Otherwise the touch screen doesn't do much, apart from display an image of a fallen Shovel Knight upon death that we're 99% certain is a reference to a similarly dispiriting image in the NES disaster Silver Surfer. Collecting treasure is one of Shovel Knight's most urgent goals...even though you don't actually have to do it. There's something relentlessly satisfying about digging up gems, smashing locks off of chests, and raking in a huge haul after a boss is defeated. And yet, the amount of temptation you'd like to surrender to is up to you. You can explore all of the optional rooms and paths, but the ones that lead to treasures are the deadliest, so it's safer not to. You can crack open various posts throughout the levels for a nice flood of cash, but those "posts" are actually checkpoints, and if you destroy them you'll lose your progress when you die. If you do die, will you return to the place of your death to collect your scattered bags of riches? If you manage to snag them, you lose nothing...but if you die again, they're gone for good. This passive element of risk/reward is one of Shovel Knight's most impressive tricks. While money in this game has several uses, each of those uses are optional. Collecting massive amounts of gold and gems is unnecessary, and yet totally irresistible. That's at least partly due to the fact that the game is so much fun. Sure, you might live longer if you don't try to navigate that maze of death spikes for the chest that's on the other side, but if you don't do that, you're missing at least one of Shovel Knight's excellently designed rooms, and that just won't do. Every detail of the game is perfectly chosen, from the way liquid splashes outward due to the 3D effect to the unimpressed face of the toad that listens to your bad jokes. That autostereoscopic 3D doesn't affect gameplay in any substantial way, meanwhile, but it does add a very nice element of depth, helping the levels feel larger and more rich. 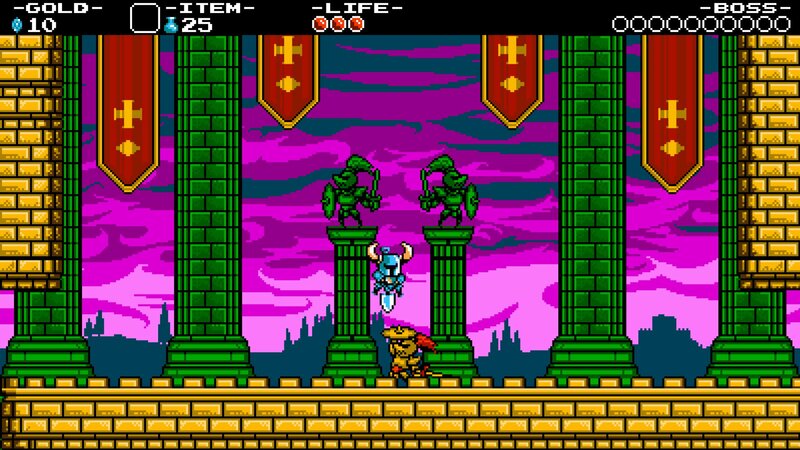 Every stage has at least something going on in the background, and certain effects — such as the dirt Shovel Knight scoops from the ground — make their way into the foreground, which is a nice touch. The soundtrack, likewise, is an impassioned collection of compositions that fit the specific atmosphere of each stage flawlessly, and yet still manage to stand alone as excellent tracks in their own right. It's also worth noting that while the Wii U version incorporates Miiverse with its "Digger's Diary", the 3DS entry has a StreetPass Arena instead, which is unlocked early in the story. Here you will have a tight timer and be asked to collect gems; whatever you do in this time will be recorded, and getting a StreetPass hit means your recording will be overlaid with somebody else's, the winner being determined by who collected the most gems or who managed to successfully land a hit on the other person. It's a minor feature and doesn't amount to much more than a novelty, but it's nice to see the game taking advantage of the unique features of the portable system. All of this is superficial to what truly matters, however. 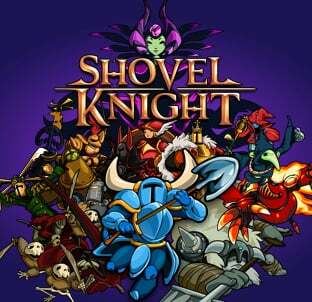 To understand Shovel Knight you have to feel Shovel Knight. It's a game that cannot be captured in screenshots, in video, or even in a review. It's a game that has to be experienced to be understood, and the experience is one that every fan of action platformers should enjoy. 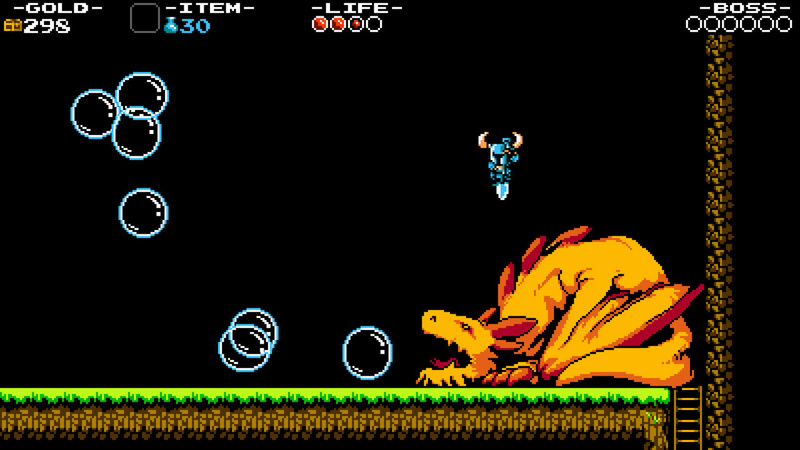 Shovel Knight is more than just a great platformer; it's a celebration of classic gaming. Excellent controls, gorgeous graphics, an incredible soundtrack and endearing characters make the game worth playing, but top-notch level design, varied gameplay, hidden rooms, optional challenges and a deceptively rich combat system make it brilliantly memorable. The entire experience comes together so naturally that it feels more like a recently unearthed gem from the days of the NES than it does a latter-day attempt to milk nostalgia. Shovel Knight is the rarest kind of game: one that set sky-high expectations prior to release, and then managed to exceed all of them. It's a must-buy for platformer fans, and one of the most charming and satisfying experiences on the 3DS eShop to date. Sweet, that will be a future buy ! I'm expecting a lot of 9-10s for this game. Woooo! Been waiting a long time. Great review, Phil. Any difference between 3DS and Wii U versions? The way you guys raved about this game I'm surprised it didn't get a 10. Why is that? What's holding it back from perfection?? Grabbing this today! 7 on Eurogamer with PC version. IGN gave it a 9. I hate watching gameplay videos but I recently caught myself watching 10 minutes of Shovel Knight on Wii U. It is THAT good. Prepare to taste justice...SHOVEL JUSTICE! @KnightRider666 "Upgrades to your weapon and armour add minor wrinkles to the otherwise simple moveset"
None of the two reviews here mention length, but I am still picking this up. Is the 3DS version also getting the post-launch updates to add characters and such mentioned in the Wii U review? Damn. I cannot decide which version to get. Ugh have to wait until I get out of work to download and play. Been waiting a long time to play Shovel Knight. I'm one of those weirdos that tends to focus on how enjoyable the game is while it lasts, rather than how long it lasts. But, like most challenging games, it's impossible to say how long it will take you. There's an achievement for finishing it in under an hour and a half. I don't imagine many people will be unlocking that achievement their first, second, or third time through, though. Replayability is mentioned in the review. There's a New Game +, achievements to unlock for different play styles, alternate routes, hidden rooms, optional challenges, and so on. @sinalefa ign says it is about 8 hours the first run though. For $15 that sounds good to me and it has new game+. Thanks a lot. Sounds very good. I get that, but can't you compare it to say, a Mega Man game, regarding length? I wonder if should get this on 3DS or hold out for what I assume will be a Vita version eventually. Most of the time the 3D effect isn't worth it. not when the OLED screen makes everything kind of "pop out" anyways. Yep getting it on PC and if its anything like Cave Story game feel, then getting it on 3DS as well!!!!!!!!!!!!! Is it really needed to do two different reviews for the same game, on the same day? Yeah, of course, there are different extra features in each version, but I think those could easily be covered in a single review. You could even give us two separate scores at the end, if differences were significant enough. Anyway, I digress. I can't wait to get this on my Wii U tonight. It feels almost surreal that it's finally here. can't you compare it to say, a Mega Man game, regarding length? It's longer than a standard Mega Man game, in terms of number of stages and things to do, but since it plays much differently that doesn't mean much in terms of playtime. You might be significantly better at this game, or significantly worse. I wouldn't compare it to a Mega Man game in terms of actual gameplay. Length estimates in other reviews have already varied substantially. There's no clear way to measure such a thing in games that don't hold your hand and guide you through. Playing is the process of learning and discovery, which is different for everybody. I will say this, though: if your main interest in Shovel Knight is length, you haven't been paying attention to Shovel Knight. @Philip_J_Reed Is it in 3D? The Another World review didn't mention that either. It's a deal breaker feature for me if it doesn't. Nice review though. @6ch6ris6 between 7-8 hours inthe first play through according to IGN. I'm really glad they made a nice use of the stereoscopic 3d. I may be in the minority who still enjoys the 3d. Even though 3d isn't "cool" like it used to be, I still happen to like it regardless, and I appreciate that the developers still took the time to cater to that audience. I'm buying this as soon as I get home. If you scroll up a bit you'll see a review. That may answer some of your questions. I got two levels in last night before heading to bed, been playing since I woke up this morning. Pure awesomeness. This is the version I'm getting, I love that streetpass idea. I'm so happy to hear it was worth the wait. You guys are allowed to give a 10/10 out now and then guys. Based on the review, I think it would have been warranted. btw Did u notice any slow downs (ala Megaman ) ? i mean with 3D on ? thnx in advance! @Philip_J_Reed Hows the frame rate? Does it ever take a dip? That one may make me pick up the Wii U version if it does take a hit. Guess that was just asked lol. Oh and thanks for making yourself accessible as usual!! Not bad. Will get once I have the cash. I never noticed a dip! It played very smoothly all the way through. Really tempted to get this for 3DS instead of the Wii U because of the unique and awesome 3D effect that's only on 3DS. What did the game lose that final point on? I mean if Mega Man 2 on the VC is a 10, as one example, then what exactly is Shovel Knight missing or not doing quite right that it never scored a 10 too? I'm genuinely curious because the review doesn't seem to point out a single issue with the game. Thanks for the reply. I just wanted to get an idea of its length. But I agree, I would rather have a short, deep game than a long, shallow one. And it seems this one will take a long time to master. Reading that review again and again I actually feel like this game has kinda been cheated/robbed out of a 10 it apparently deserves based on everything that's actually been said about it in the review. What else would it have needed to do to get that 10? It's really bugging me not knowing why it hasn't earned that extra point. Oh....................I wasn't planning on getting this, but now??????? $15 is a little high for me, but in July maybe I'll pick up another $20 eShop card now that I have a stable job and pretty decent paycheck...On the game itself it looks awesome!!!!!!!!!!!!!!!!!!!!! I use my 3DS more so I'll be getting this version, Streetpass seems to be used in a superb way and I like the sound of the 3D! Will be getting. As soon as payday comes next week, instabuy. This looks pretty cool. I wonder, how long is the main game? Does it has post game content? Great, great review, Phillip. From the very first time I layed eyes on its curious pixels, I knew this was a game that would finally set the record straight when it comes to making a retro-inspired video game. Are the L/R buttons needed? We'd know it when we see it. The fact that there are no glaring issues doesn't automatically qualify a game for a 10. It's a great game and a heck of a lot of fun, one I can recommend to literally any fan of platformers. But it doesn't quite reach 10 territory for me. It's that simple. Wow, two shovel puns in a single header? @KnightRider666 @S-Miyahon @Kirk I'm also curious why this didn't get a 10 since the review seems entirely positive without a single negative mentioned. S-Miyahon, 'minor wrinkle' just means it adds a new element making it slightly more complex, which I don't understand to be negative. I'm guessing by @Philip_J_Reed 's response that to get a 10 it has to have some almost undefinable magical quality that makes it truly special, which I guess Shovel Knight doesn't quite reach. Maybe the story would have to truly be mind blowing or something to get a 10. I'll gladly give them my $15 for releasing an amazing game in this god-awful summer drought! Can't wait! Well I presume it's got to be something in the overall gameplay, that seemingly intangible thing that separates a great game from something truly magical, because you've not pointed out a single tangible aspect where it fell even remotely short. Not even just a mention that while it's near perfection it just lacks that extra tiny bit of indefinable magic that warrants a 10 or whatever. In the past a game like Shovel Knight, with a review as totally and utterly glowing as the one above, would usually/normally end up with a score of 10/10 and surely in a mag or on a site that scores games on a 10 point scale. I feel genuinely sorry for modern indie developers when they can make a game that is for all intents and purposes a perfect game in basically every area, going by the 100% positive and glowing content of this review, but can't nail a 10 on a site that scores on a 10 point scale. It's different when you see a site that scores on a 100 point scale maybe gives a game with a review this positive a 95 or whatever. Now, to be clear, I might play this game myself and not even think it's worth a 9 but you'd certainly see something in my comments about it that would reflect that in some way and most certainly if I were writing reviews for a professional games site. That's just my feelings after reading that review and then seeing that the game didn't get a 10. It caught me off guard after what I had just read and doesn't sit quite right with me. God I hope it's not the frikin story that held it back from getting a 10 because games like Mega Man 2 and Super Mario Bros 3 basically have no stories, or certainly less than Shovel Knight from what I've seen, and both of those games were deemed worthy of a 10 even by the standards of this modern day and age. Not from me, it wouldn't. In over 200 reviews, I've given out a whopping two 10s. It's very, very rare that a game pushes over that hump for me, and indie games don't "deserve" higher scores any more than any other game does. I'm not reviewing the size of the team; I'm reviewing the quality of the release. And you may well think this is better than Mega Man 2 and Mario 3. I personally don't. But it's never a review's job to echo what its readers feel. That would be impossible, and would also negate the purpose! Yeah, I'm still trying to ponder what was so magical about NightSky that it got that elusive perfect 10. Note: I have no idea if Shovel Knight is better than Mega Man 2 or Super Mario Bros 3 (at first glance and based on at least having played Mega Man 2, so I know how good I personally consider that game to be, I'd say Shovel Knight certainly looks like a better realized game all-round imo) but based on your review it would seem to be every bit as good in every single area and both those games received 10s on this site so it just sits a bit uneasy with me that 20-30 old NES games, that do actually have some very perceptible issues (like the dull/desturated colors and flickering at the edge of the screen in the Wii U VC version of SMB3 for example), can still score 10/10 in this day and age but this game gets a 9. I mean it might not be as good as those games for whatever reason(s) but personally I just like that to be quantified in some way in the review if that's the case and especially a review that's as totally and completely glowing as this one. "It's basically perfect in every single way as I've detailed in my review so you probably presume it's going to score a 10 but it actually hasn't and the reason(s) you don't see a 10 below is/are..."
PS. What was the other game you scored a 10, I know NightSky was one of them, just out of curiosity? Great review, currently writing one myself for the Wii U version. This game well deserves the 9. Fantastic review Phil! I can't wait to pick this one up. This game is excellent. Yacht Club really outdid themselves with this one. @6ch6ris6 basically new game + is replaying the game with everything you've unlocked. Usually in games like this you can up the difficulty, but I'm not sure yet if this one does that..
@Philip_J_Reed: Great review man. I haven't been paying much attention to this game mainly cause I didn't want to get hyped for it and then be disappointed but after reading your review I will have to pick up this game after I finish Mega Man V. You haven't steered me wrong yet with your reviews. @Philip_J_Reed what were the 2 games you gave ten out of ten too? I completely ... dig it!! This game will definitely carve itself a place on my 3DS library. It takes many classic game mechanisms from the very best games and makes them better. Um. That's definitely a 10 on my eyes. Ya know, I was telling members how I would personally recommend the Wii U version because you get TV play AND small screen handheld play in one package, and the better graphics and comfortable controller, but, after buying both versions and playing the first stage on both, I really, REALLY gotta give props to the 3DS version. It just plays so smoothly and the 3D looks so good. Idk, it's a tough choice. You really can't go wrong either way, but I'm actually inclined to say I like the 3DS version just a smidge more now. Not to knock the Wii U version though because really, it's perfect in every way. Mega Man 2 and NightSky. Well, we'll never know, and I certainly won't pretend that personal preference doesn't enter into reviews. Considering, y'know, reviews are based on personal preference. But that's what the text is for, silly goose. If you read the text and think, "This sounds like a 10 to me," then it's probably a pretty solid buy! Others will read all the nice things I have to say and think, "None of that sounds anywhere near a 9 to me." And that's fine, too, of course. Nobody is obligated to agree with every review score. Again, that would be impossible. We do our best in order to present reviews that let you decided if you'd like to play the game. That fact that I'd give it a 9 and you'd presumably give it a 10 is academic...just as you might not give Mega Man 2 a 10 today, but I obviously did. This game is amazing and it absolutely deserved to have a physical release, I would've happily paid 20-30 bucks for this gem. Waiting for the EU 3DS release, but enjoying it on Steam for the time being. It's fun being a backer! This seems a good game to have on 3ds... but i have a wii u too. Sould i pay it two times? To understand Shovel Knight you have to feel Shovel Knight. It's a game that cannot be captured in screenshots, in video, or even in a review. It's a game that has to be experienced to be understood, and the experience is one that every fan of action platformers should enjoy. How about a demo then, YCG? Seriously, i can't think of any other way to convince me before there's a sale for the 3DS or Wii U version. OK! I just bought the PC version of this......... FREAKING AWESOME!!!!!!!!! Not sure how well this translates to the 3DS but the PC version is KILLA! The first game I kickstarted, so happy to have! Darn. This looks pretty good. I usually don't like 2d platformers that have weapons and stuff in them. The usually end up being too hard such as mega man or link 2. But Is it really that good and can it be made easier for people like me? i dont know, should i get this game? I've had this game for a few days, unable to stop playing it. Features good 3D visuals, excellent music, tight controls, and for $15 it ranks up there with AAA titles. Definitely recommend it if you have $15, or wait for a sale. Has anyone purchases it for both the 3DS and Wii U yet? If so which one did you prefer and why? I'm very torn between which system to get it for and I rarely double dip on a game no matter how good it may be:/. Any thoughts would be greatly appreciated. Thanx guys. Ah, I really want this but alas there's still no eu release. bleh. this review is skewed.. i bought it liked it but its not that memorable. its not that tight.. i dont hum the music like i do Mega Man. and definitely do not feel like its as long a game as mario for example. the map is covered by clouds and you reveal like 10 worlds? thats it? i guess im just saying we should weigh that into the score. say something like, for 10 bucks you get 10 bucks worth of gameplay. dont expect 50 dollor mario length. honestly when i beat the game, i thought i beat world 1. and i was hoping for 7 more... in my mind.. platformers are easier to design so only having 1 lava level just seems like a waste.. i would rather them put together like 4 lava levels scattered through out the map..
also.. there is nothing really original here.. they just do a good job stealing ideas from other games. mario 3's map, zelda 2's downthrust, megamans platforming, and a not so much memorable melodic soundtrack. ask me to whistle all levels of megaman..
sorry guys.. im just playing devils advocate. i know.. many will hate what i have to say but 9/10!!!!? i would say 8 at most which is still good but 9 and 10 should be reserved for games that will keep you busy as well. one more things.. there's a leve where a green thing drops down and you can hit it to move it or use it to bounce high.. it ALWAYS drips from a green thing above it.. but i found this hidden treasure chest area under and went down and got it.. and the only way out is to be able to hit a green thing onto the lava .. so inside that nook where the chest was, there is this green thing dripping from thin air. this is 1 and maybe the only example of something that a mario or 9/10 game would not have. that and other parts made it feel a bit amateurish in level design. and having the top right area harder to reach so you can access the secret areas got old quick. so predictable after you do it a few times.